So how did a young dilettante who spent his comfortable youth dancing at balls with the likes of the Rothschilds and Daisy Fellowes, become a darling of the design cognoscenti with his creations achieving more than $100,000 in today’s market? Jean Royere took a risk. Next, Royere went to work at a cabinet factory in the Faubourg Saint-Antoine, Paris. Then, in 1934, he took his third risk. Largely self taught, and a totally unknown entity, he entered a design competition to decorate a brassiere for the Hotel Carlton on the Champs-Elysées. He won. It became his first commission. After that, there was no turning back. A hugely successful career spanning 5 decades was decidedly launched. Royere was quickly recognized as a great original. He followed no school or design theory, but he had a famous stable of clients that included King Farouk of Egypt, King Hussein of Jordan , the Shah of Iran and several wealthy families in South America who were drawn to his creativity. Soon, in addition to his offices in France, there were Royere branch offices in Beirut, Cairo, Lina, St-Tropez, Sao Paulo and Tehran. In the 1940’s and 50’s, Royere became one of the first ever globe-trotting designers. Some say Royere’s work defies categorization. He was very prolific. Although his work is unlike any other, I think there are some themes. He used bright colors, organic and sinuous forms, and precious materials. His work ranges from “puffy” upholstery to gilded-iron “Eiffel Tower” consoles to geometric designs. Additionally, his oeuvre has a touch of whimsy. Let’s take a look at some of his most iconic pieces. As you will see, though French, obviously, he had the gift of Blarney—he gave some very charming names to his designs. First up is his Polar bear sofa and chairs. Introduced c. 1949, a Polar Bear set including a sofa and pair of chairs recently sold for over $800,000 at auction at Phillips New York. Despite the name, the Polar Bear, or “L’Ours Polaire” collection came in many bright colors in addition to white, like orange model in the first photo. 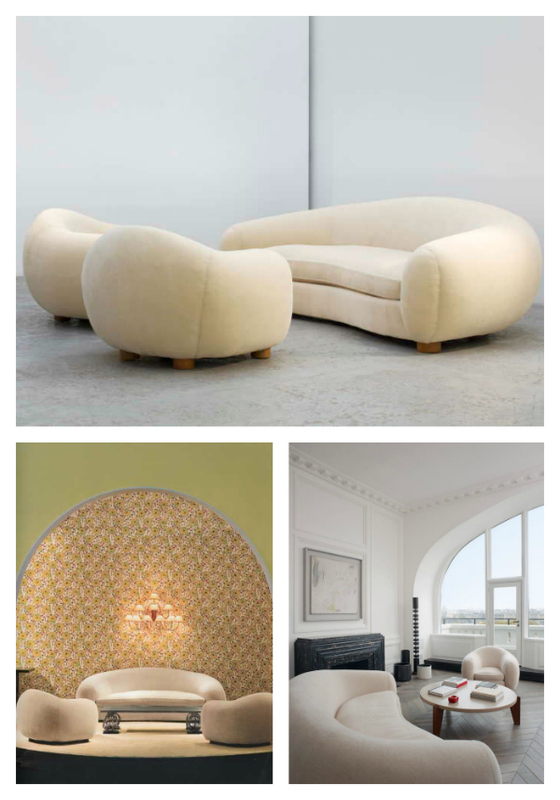 Other well-known upholstered pieces are Royere’s Egg chair and ottoman, and his Elephant chair. In addition, Jean Royere did beautiful work in metal. In this medium, his croisillon (also called “Tour Eiffel”) collection of furniture stands out. Royere’s “Ondulation” series of lamps, tables and benches celebrate a wavy line that Gallery BAC has likened to flowing water. A close up of the distinctive ball and wave in Royere’s “Ondulation” collection, plus another light fixture in that “wavy’ series. Royere also is known for his whimsy–you can see this in his “Yo Yo” and “Boule”collections, his “Starlette” bed and some of his patio furniture. Some of Royere’s more whimsical designs include, clockwise, his “Starlette” bed, “Boule” andirons, patio furniture and “Yo Yo table and chair set. Finally, no post on Royere is complete without this light fixture from his “Laine” collection. It is considered one of his finest works. When it comes to Royere, it’s tough to cover everything. His creative work is so widespread. Fortunately, there is help. I recommend the two-volume set on Royere’s work by experts Jacques Lacoste and Patrick Seguin. I will leave you today with some beautiful renderings of Royere’s interiors. Be inspired. Photo credits: Many of these images are all over the web. Despite google searches etc., I often could not find the original source of the image. Please comment if you know the source and I will update. Sources I could find are noted. First photo, interior design Dimore Studio via agentofstyle blog. Polar collage, top and bottom left image from Galerie Patrick Seguin, bottom right via Joseph Dirand architecture. Egg collage: flower egg chairs , gray egg chair. Ellen DeGeneres photo from the New York Times Laine Royere quote from here.